UFC King Frankie Edgar is an Underdog … AGAIN?! Just because Octagon brass have yet to officially announce the lightweight scrap between champ Frankie Edgar and Gray Maynard, it hasn’t stopped the Gambling Gods from dropping their two-cents on who will be donning UFC gold after New Year’s Day. Edgar will be entering his third consecutive title fight when he rematches Maynard inside the MGM Grand Garden Arena in Las Vegas, Nevada on January 1st. The scrap marks his second straight as the division’s king. Despite sweeping former ruler BJ Penn for arguably 50 championship minutes, the Jersey boy will once again be entering the cage as the underdog. 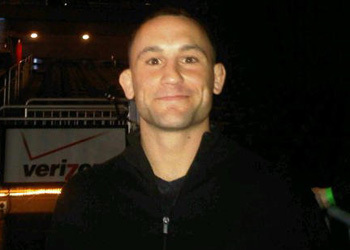 Maynard is looking for a repeat performance of his lopsided unanimous decision win over Edgar from back in April 2008. He stakes claim to a nearly perfect 10-0 (1 NC) record and schooled former top contender Kenny Florian at UFC 118 to earn the nod. Speaking of nearly flawless, Edgar’s resume reads 13-1 courtesy of Maynard. In addition to his back-to-back drubbings of Penn, he’s also rattled off five straight wins overall. It will be interesting to see how the money moves as game time approaches. If Edgar were to retain his ‘dog status, it may not bode well for the Xtreme Couture trained fighter (Please see: UFC 112 and UFC 118).